Amazon Cloud Player has found itself a new home on Sonos multiroom speaker systems. The streaming deal means that anyone who buys Amazons MP3s will be able to instantly stream them on their Sonos hi-fi systems. Given that Amazon announced the arrival of AutoRip in the UK back in June, it means that anyone who buys CDs or vinyl through the online retailer they will be able to stream this music as soon as they click 'purchase', which will be a definite plus for many. 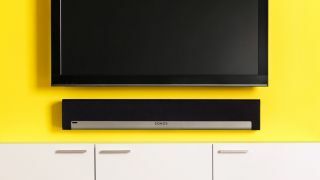 For Amazon, the addition of Sonos is another string to its rather musical bow. Alongside Sonos systems, the Amazon Cloud Player is now available through Kindle Fire devices, Android, iOS, Mac and PC. As for Sonos, the list of compatible services is looking very healthy at around 15 - including Spotify, 7 Digital, Deezer and last.fm. In the UK, Amazon's Cloud Player is in direct competition with iTunes and its Match service and Google Play Music All Access. All of which offer streaming alongside a mountain of storage for your own music. What cloud service should you choose? Find out here.